What kind of feelings does the reference to Jesus as “God with us” give rise to in you? Does the fact that God was with us on the earth in a human form impact the way you experience temptation, or suffering, or sickness, or conflict? What about the way you experience happiness, pleasure, or family? Why or why not? What do you think the conversation between Joseph and Mary was like when he told her his decision to take her as his wife? Oh, God, that you were here, with us, among us, living in the flesh! It’s almost too wonderful to believe! I wonder how it was to leave the majesty and perfection of heaven for this earth with war, and disease, and dust, and death, with colds, and heartbreak, and loneliness. Thank you for knowing how it is to be in this body, when it aches with fear or pain or loneliness. Thank you that you know how it feels when I can barely stand in the face of temptation. Thank you that you know what it is to mourn, to shake with tears of grief and longing. Thank you that you came to be with us. Jesus. 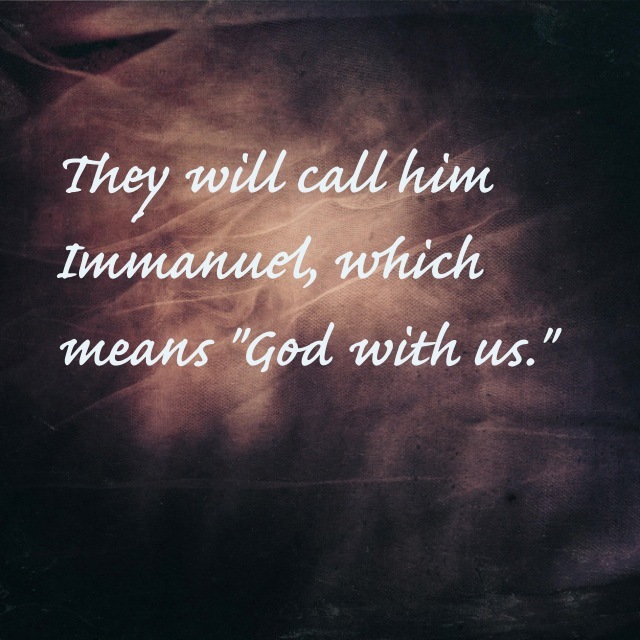 Our Immanuel.